I'm a new writer studying at university in Leeds, West Yorkshire. 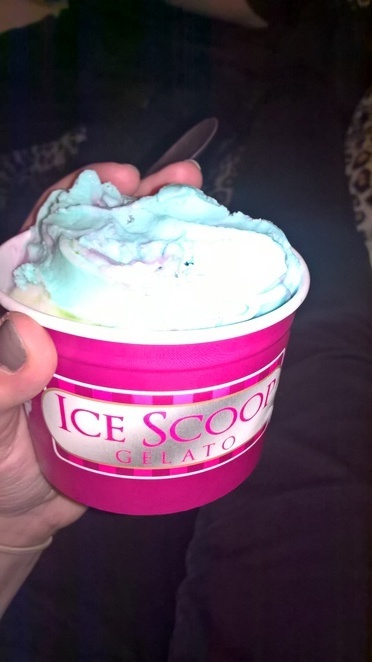 Ice Scoop Gelato is my local ice cream parlour (LS6). I have visited numerous times and I have never been disappointed with either the service OR the food received. It is usually open by 12 midday and is then open 'til late' which is typically 11pm. Perfect for a late night snack. Whenever I have entered the parlour, a staff member has greeted me and asked me whether I intend to eat in or out. On several occasions, I have chosen to eat in because that's part of the experience. I was welcomed warmly and seated very quickly. What I really like about the service you get here is the friendly manner in which staff members work. Smiles all round with no unpleasant atmosphere and for me, that's essential for a successful business. If you're an anxious character like myself you probably HATE having to go up to the counter just to order your own food! This isn't the case at this ice cream parlour, because of the friendly and welcoming staff I have never had an issue ordering my food at the counter which is not a regular occurrence for me and I'm sure some of you can relate. Whenever I have opted to eat out, the service has been extremely quick and you can even watch them scoop up your chosen flavour which is a nice touch to the experience. You get to watch the hot scooper gracefully glide through the ice cream until a small ball is formed. If you enjoy food as much as I do ... this is a beautiful thing to watch before your own eyes. You can pay by card or with cash and there is no hassle when doing this at the till, making the parlour a highly efficient place to go if you want to quell your sweet tooth. Individual Scoops both of gelato and sorbet. I've decided to rank the scoops I have tried so far in order of preference. 1)	Cookies and Cream: is an excellent blend of chocolate chip cookies and cream, when you dunk a cookie in milk/cream ... this is the gelato version and is by far my favourite flavour to date. 2)	Bubblegum: an odd flavour for some, since you can't actually eat bubblegum but this gelato scoop is bursting with flavour and has a brilliant blue colour to it. 3)	Lime Sorbet: one of the best sorbets I have ever had. It has little chunks of lime zest in it to give it that extra kick and it's a fantastic palette cleanser. 4)	Mango Sorbet: My boyfriend's absolute favourite. Gets it every single time. I tried it once and it is definitely worth being in the top five. It's an exotic choice and if you like tropical fruits, this is the sorbet for you! 5)	Red Velvet Cake: Contains genuine bits of red velvet cake .. .need I say much more? 6)	Vanilla: This is my go to flavour but it's surprisingly low on the list and that's simply because there are so many different unique flavours to try that are simply no match for your plain vanilla. 7)	Oreo Cookies: Another favourite of my other half. Also, contains genuine bits of Oreo cookie… does it get any better? Well, the truth is it does ... there are so many different things to try! So let's move on to the sundae and cookie dough! You may think it's odd to buy a kids sundae when you're an adult but to be honest ... you don't need the bigger version because it's more filling than you would expect! It's topped off with fresh fruit, strawberries and banana, and it comes with your standard vanilla ice cream. A true classic. The ice cream itself is hard to describe in plain English… it's smooth, thick, flavoursome and much more. I chose the banoffee cookie dough. Many complain about this product because it's not got enough banana flavour to it but I disagree. The fresh slices are enough to counter the sweetness of the caramel like toffee in the dough and is topped off with two scoops of your choice. I chose cookies and cream (there can never be too much cookie!) and vanilla which I've found to be a pleasant duo on its own as well as a complimentary duo for this particular dish. I would definitely try this dish again. It's impossible to forget the milkshakes! When you eat in they are served in a tall glass with a chocolate wafer that looks like a thick straw and is also served with an actual wafer that has their logo on it! Neat right? The presentation is fabulous. There's a ton more to try including, waffles, a gelato pizza and other beverages including coffee. Unfortunately, I do not enjoy such drinks so I will let someone else review that product! You'll notice that there are some rather poor reviews and comments on there but I would just like to point out that this establishment is in Hyde Park Leeds ... not Mayfair London and this should be taken into consideration as well. Considering the location and target audience (students) £1.50 per scoop really isn't that much to ask for especially when the product is of such a good quality and served by a friendly face. It comes in small cups with napkins and plastic spoon(s), so you're not just paying for the ice cream. It's my favourite place to go for desserts and I look forward to my next visit.